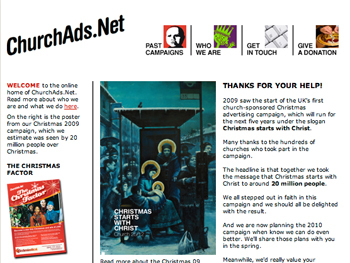 ChurchAds.Net (previously know as the Churches Advertising Network) is a volunteer network of media professionals which creates advertising campaigns every year, usually at Christmas. The campaign materials are designed to enable church groups across the UK to run radio and poster adverts in their own local media. This creates an integrated national and local campaign. ChurchAds.Net is most famous for showing Jesus as Che Guevara (1999), and in a beer glass (2006). I’ve been a member of the network since 2005 and have worked on their Internet side, as well as producing the website. The site works as the ‘wholesale’ point where churches can download or order advertising materials. We also use it to run competitions, when they are part of our campaigns.